Three huge intersecting dark lanes of interstellar dust make the Trifid Nebula one of the most recognizable and striking star birth regions in the night sky. The dust, silhouetted against glowing gas and illuminated by starlight, cradles the bright stars at the heart of the Trifid Nebula. This nebula, also known as Messier 20 and NGC 6514, lies within our own Milky Way Galaxy about 9,000 light-years (2,700 parsecs) from Earth, in the constellation Sagittarius. 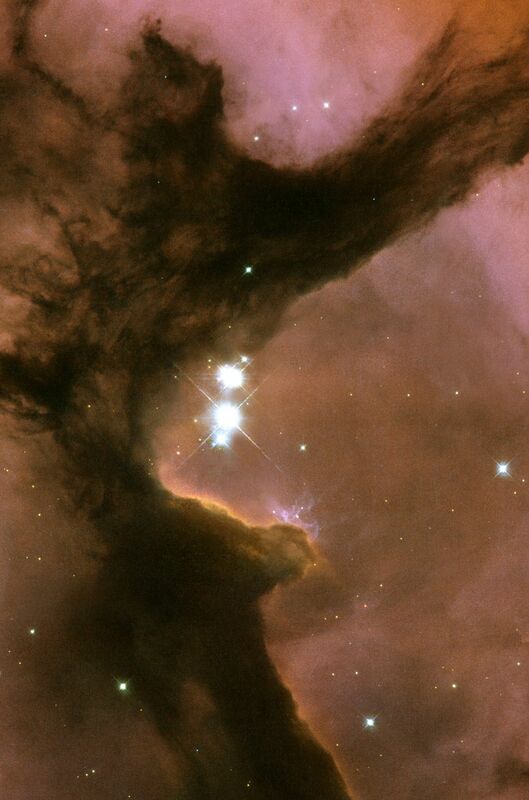 This new image from the Hubble Space Telescope offers a close-up view of the center of the Trifid Nebula, near the intersection of the dust bands, where a group of recently formed, massive, bright stars is easily visible.